Welcome to new readers who are here visiting from Victoriana Quilt Designs blog as well as those of you that have been here before. Please feel free to browse and look around my blog. Underneath my header photo, I have links to different pages. There are also tutorials there as well as along my side bar over to the right. I'm taking part in a blogger's Meet and Greet to welcome Benita to the blog world. She has set up this meet and greet to help those of us that blog to get acquainted and visit each other's blogs. Benita is starting a new blog, so I'd like you to hop on over to her blog and take a look around. 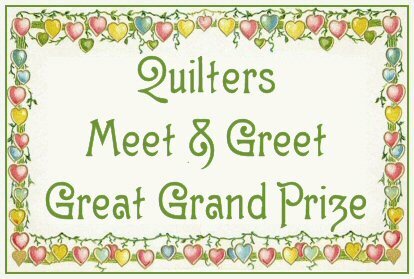 There will be prizes, too, so be sure to take a look at her blog and enter. I'll tell you a bit about myself. I've been quilting for over 20 years and have tried many different kinds of quilts. Take a look on the quilts tab underneath my header photo. Benita asked us to send her a photo of our favorite quilt. The Dear Jane quilt holds so many good memories for me because I have met people from all over the world through connection with this quilt. Twenty years ago, some of the quilters making this Dear Jane quilt started holding a retreat up in Shipshewana, Indiana. I've been going to the Jane Stickle Quilt Retreat for about 18 years and have met people that I wouldn't have met otherwise. Many of them have become close friends, and we've shared each others joys and sorrows. We will all meet again soon at the retreat, and I can't wait. I like all kinds of quilting, but right now I am a bit obsessed with English Paper Piecing. Using paper pieces and a Sewline glue pen has made the basting process very easy. I love to find a piece of fabric that I can fussy cut to add a secondary design to a hexagon or a 6 pointed star. You can see my fussy cutting tutorial here. Here is the link to Benita's blog. I hope you will stop by her blog, have a look around, and say hello while you are there. Of course there will be prizes. Visit the link below or click the prize photo to be entered for a chance to win. Oh my goodness that Dear Jane quilt is absolutely stunning. A true work of art! How fun that you've been retreating for 18 years. I know those friendships have grown deep! I wish some day to go on a retreat, but this full time 8 - 5 gig really gets in the way! Maybe if I retire someday I'll be able to go. Sounds like you have great fun on your retreats. Your DJ quilt is beautiful! Seeing your wonderful Dear Jane laid out on that snowy background has helped to cool me down on this humid and stormy night. Love your hexies - you have the best combinations of fabrics to create unique and creative designs! Oh dear me, that Dear Jane Quilt is a work of art ( and patience!) I love it. Your Dear Jane quilt is a true heirloom! I have never been to Shipshewana. I hope to visit there someday! Lovely to meet you and your blog. Love your projects. Wow! Jane really sent you on an adventure. Enjoy your upcoming retreat!! Your dear jane is awesomely breath taking. loved it! I understand why those who make Dear Jane call it a journey. Yours is lovely. It's nice to meet you on the Meet & Greet. Your Dear Jane is wonderful. Visiting from the Meet and Greet. Good to meet you--I think you must have a lot of patience and perseverance to do a "Dear Jane"quilt!! Your Dear Jane is beautiful and an inspiration to me to start my Dear Jane in blue. I even know where all the parts to it are. I bought it as a BOM and never started it. All your work is gorgeous. I want to look at your tutorial for fussy cutting, too. Thanks for participating in the Meet and Greet. Love your Dear Jane quilt it is just gorgeous! I enjoyed looking at your Blog and like your EPP projects. Thanks for sharing. I have been in awe of the Dear Jane quilts for a long time. Just the thought of all those pieces is mind boggling. Thank you for inviting us over for a visit! The Dear Jane quilt was a stunner and one that I'm sure you're especially proud to have done. I love EPP, too. I also use the glue pen for basting. That's the way I started but I've always thought it must be better for fussy cutting than thread basting. Love your tutorials and your Dear Jane quilt is gorgeous! Your Dear Jane is a magnificent accomplishment and it turned out so lovely, too, LuAnn. Beautiful Dear Jane. I quilted one that was embroidered. I'm not sure I have the patience to do the pieced version. Your tutorials, I could not stop looking and thinking " Do I have time to do this"?. Blocks cut to make a new on-point one, string blocks and so much more,thanks so much for them all.